Updated Thursday February 7, 2019 by Scott Hurt. 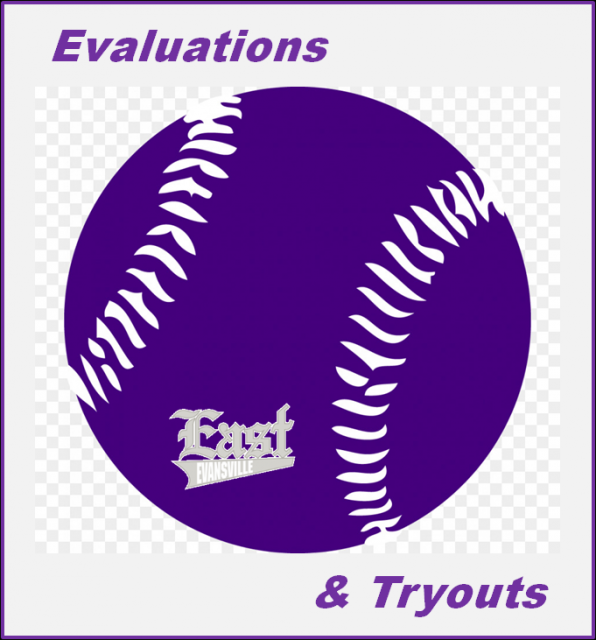 This year’s evaluations and tryouts for all leagues* will be held Monday, Tuesday, and Thursday, Feb. 25, 26 and 28, 2019 at Harrison High School, 211 Fielding Rd, Evansville, IN 47715. Dates and times vary by age and league. Please read carefully below. Please arrive 15 minutes prior to the respective start times. The 5/6 Instructional League will not have player evaluations. Players may request a coach and teams will be assigned by March 15, 2019. ** All 6 year-olds wanting to play up in the 7/8 League, must go through a pre-draft assessment. They will be evaluated by a committee of East coaches and officials who will determine if they are prepared for the 7/8 League. Meaning, they can catch, they can throw, they can hit, and they can pay attention at the level necessary for the safety of themselves, as well as the other kids in the league. Click here for more information on the 5/6 Instructional League. Players must attend their respective tryout date to be eligible. 6 year old Evaluations** | Monday, Feb. 25, 2019 | 6:00 p.m.
7 year old Evaluations | Tuesday, Feb. 26, 2019 | 6:00 p.m.
8 year old Evaluations | Monday, Feb. 25, 2019 | 7:00 p.m.
Click here for more information on the 7/8 Structured Pitching Machine League. Players must attend at least one tryout to be eligible. The below dates and times are for our 9/10 League only. Those who wish to try out for our 9-12 Major League must attend those tryouts as well. Click here for more information on the 9/10 League tryouts and 9/10 League in general. Click here to register for either the 9/10 League or BOTH the 9/10 League and 9/12 Major League Combo. Players must attend at least two tryouts to be eligible for the draft. The below dates and times are for our Major League only. Those who wish to try out for our 9/10 League must attend those tryouts as well. *These dates/times are for potential Major League players only. To be eligible for the 9/10 League, those players must attend those tryouts as well. Monday, Feb. 25, 2019 | 6:00 p.m.
Tuesday, Feb. 26, 2019 | 6:00 p.m.
​Monday, Feb. 25, 2019 | 7:00 p.m.
Thursday, Feb. 28, 2019 | 7:00 p.m.
Click here for more information on the 9-12 Major League tryouts and the Major League in general. Click here to register for 9/12 Major Only or the 9/10 League AND 9/12 Major Combo. Players must attend tryouts to be eligible for the draft. The below dates and times are for our Pony League only. Click here for more information on the Pony League.